Okay, I’m pretty sure we were in South Carolina. I don’t know where exactly, so I’m counting this as a second trip to the first location even though it isn’t. I took a couple days driving to Florida so everyone has some company, stays awake, and makes it home okay and then flew right back home. I’ve had fond memories of lucking into our original visit in the more northern state. Since then, I’ve had a wider range of Q, some much better, but never with a drive through. This location actually has seats inside and we are greeted by a weary but smiling young lady who really went out of her way to welcome and serve us. Some real Southern hospitality in quick service. I didn’t try the burger. It was functionally good by report. 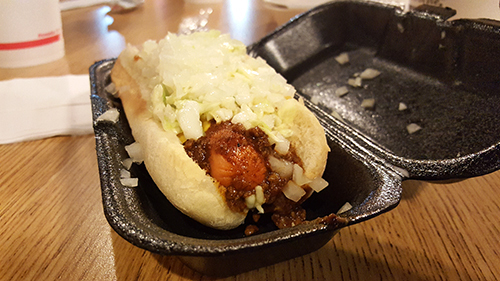 I tried their Cookout style chargrilled hotdog with chili mustard slaw and onion. It was fine, a bit of a mess (which I like on the plate but not so much on the palate but the grilled dog did make for an improvement). Everything else appears the same. 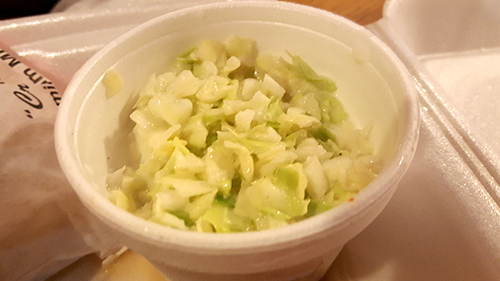 Reasonable, just above average fries, darkly fried and corny/oniony hushpuppies, and light vinegary slaw. All familiar and really pretty good overall. 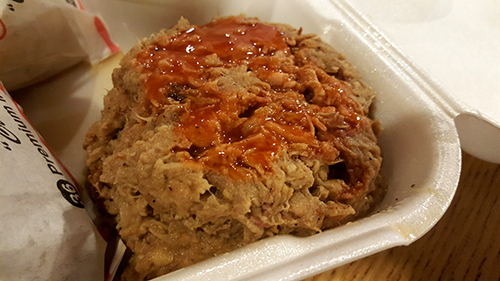 The scoop of pulled pork has evidence of smoke, is moist and topped with a squirt of Texas Pete hot sauce for a little zing. 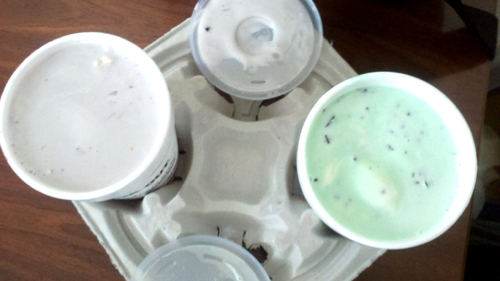 What was even better than I remembered (a little difficult, as I remembered them fondly) their shakes. Cherry cobbler…yes please. Swenson’s has some great shakes…it’s a good thing Cookout is so far away, I’m round enough as it is. This stop violates every rule we started off with this goofy adventure. It’s a place that I’m pretty sure is a franchise…and it is a drive through. Why in the world would I ever bother to tell everyone what McDonalds is like. You already know and your perception is more important than mine. We started this focusing on small or faraway places that most folks likely haven’t been to so if they ever found themselves close by they would have some help deciding. Who am I kidding we did this so my mom would get online. But still there are rules. But we made the rules so who else cares. Plus we broke them purposefully for the Cookout. Last time we were in Durham, years ago, we tried to find something to eat and failed and passed this utilitarian looking drive through on the way back to the hotel and decided it might be better than being famished. We both got the same thing and headed back to the hotel expecting to simply imbibe some calories. 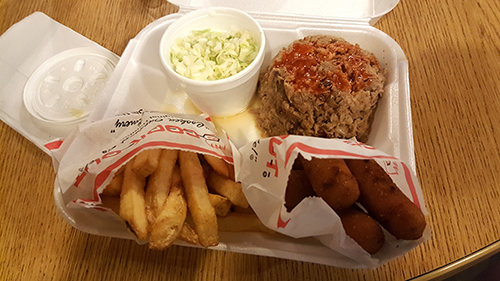 We opened our bbq plates and found a scoop (literally shaped like a scoop of ice cream) of East Carolina Style BBQ Pork, a container of slaw and two paper bags with fries and hush puppies. In the words of Dr. Evil…”Right”. 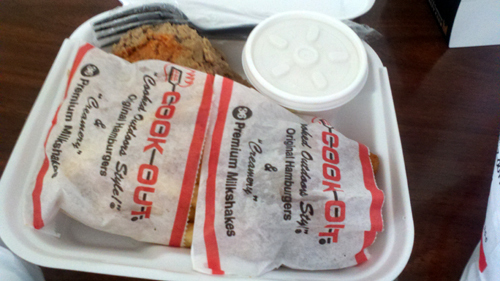 It was probably the best thing we had in Durham that particular trip. We returned to reminisce and wanted to share…so much for the rules. We ordered the same plate combo and added a cheese burger and o-rings to see if everything really is “Cooked Outdoor Style” like everything says. The Q plate is exactly the same as our last experience. 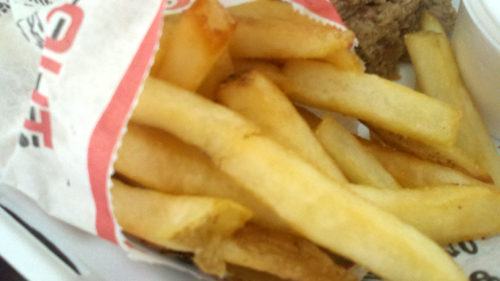 The fries are super fat and well done…apparently we should add a deep fryer next to our grill and smoker out back. 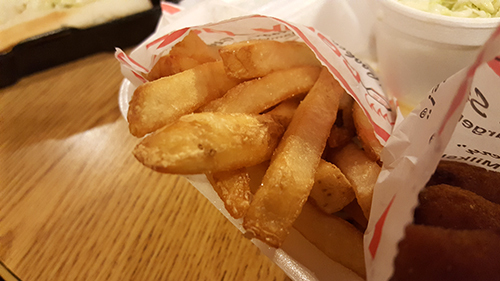 Sure I’m being facetious but the fries make me think it actually might not be a bad idea. 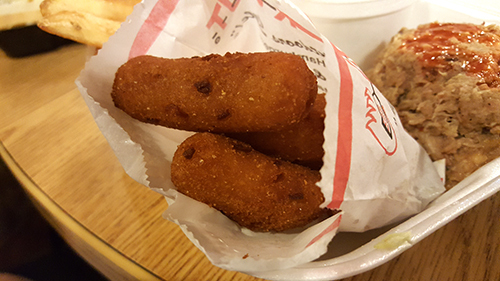 The hush puppies have that crunchy to doughy light onion bite you would expect. 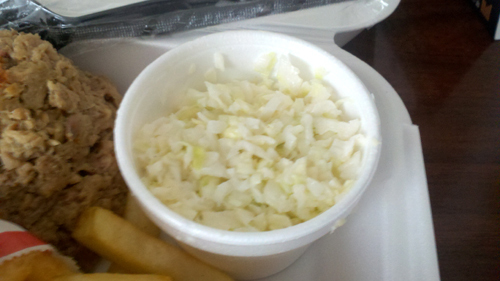 The slaw is a mix of vinegar (Welcome to East NC) and something with some dairy. The pork itself has a nice layer of smoke, lots of tang from the vinegar all balanced out with a light sweetness and a bite of heat from the bits of pepper visible in the mound. 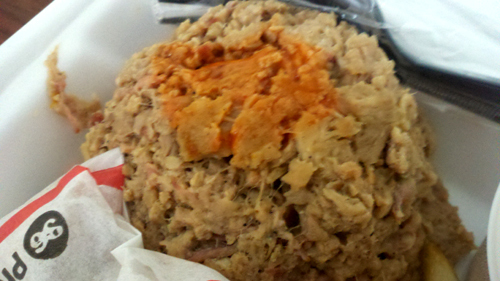 The real magic for me is mixing the pork, slaw and pups into a rich peppery mash. So good. 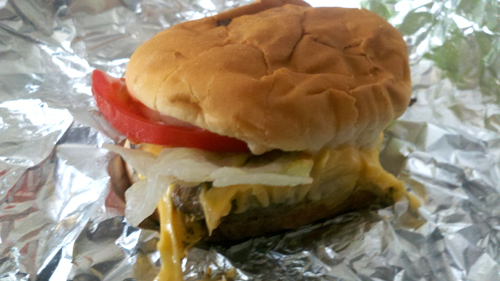 The burger was also extraordinary. 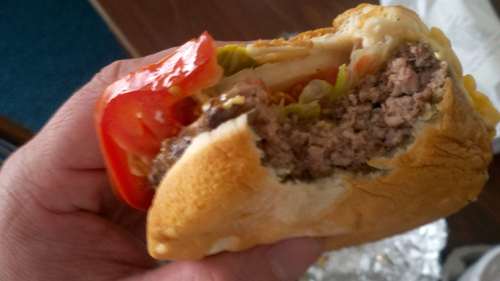 The burger itself has the flavor that makes me think of burger, nothing fancy, nothing odd, just good ingredients treated well. The toppings are fresh and flavorful. No other drive through I am aware of would be pleased that this place opened down the street. No hope to compete. That simple. The onion rings were much more ordinary and typical fast food than the rest of the order. 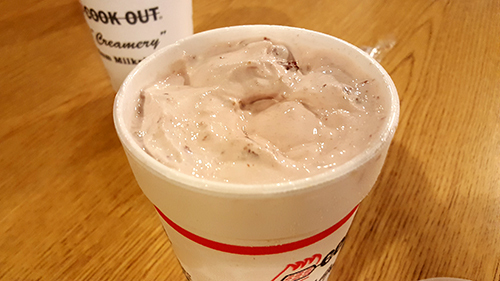 The thing that Cookout does really well is their awesome shakes. There are loads of flavors to choose from and so many of them stray so far away from the vanilla, chocolate, strawberry standards. 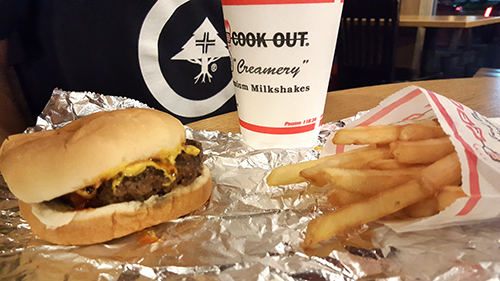 The first time we went I tried the peach cobbler shake and dropped it on the hotel room floor after my first taste. This was followed by about five minutes of incoherent ranting and stomping around the room. Secondly because I now had a mess to clean up, but more importantly, that first slurp…and now it is oozing into the dirty footprints of thousands. Sorry, no five second rule here. I had to let it go. Sadness. I initially planned to right the tragic wrong of years ago, but when I saw blueberry cheesecake on the menu, well let’s just say you can’t go wrong with either. The ice cream is top notch, the fillings are super fresh and they culminate in a cold and rich concoction that will make you stop counting calories for a week. Hey, this thing is loaded with fresh and whole blueberries…sounds good for me. Steph had a mint chocolate chip shake. 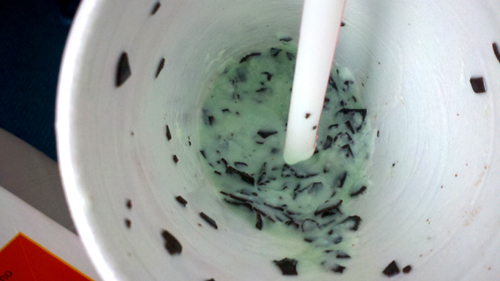 I don’t know if you have ever had mint chocolate chip ice cream where quality and warm chocolate is poured into the churning base which shocks it into thin, flat chocolate shrapnel that just melts on your tongue. This is exactly the texture of the shake where copious quantities of chocolate float in the rich and minty shake. 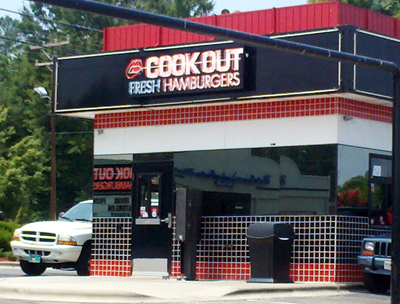 If you ever find yourself in the area and see the sign, you have a chance to try my favorite drive-thru. 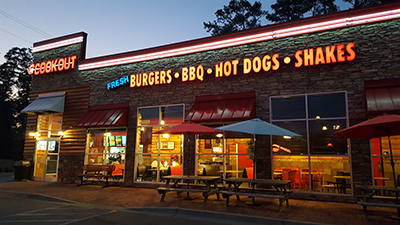 If you go to one of the national chains instead…shame, shame, shame.